I hate long travelogues, so I'm going to take you on a very short tour of Eastern Europe, starting with a view of the elaborate Parliament in Budapest, built when Hungary was part of an empire. 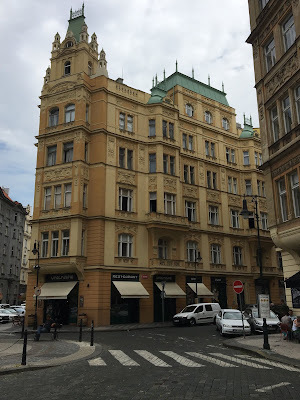 We toured the Jewish Quarters in both Budapest and Prague, which was pretty painful. The Dohany Street Synagogue in Budapest is the 2nd largest in the world, but only fills for the High Holy Days. The most upsetting memorial for me were the cast-iron shoes placed along the Danube, where Jews were tied in groups of three and pushed into the river. 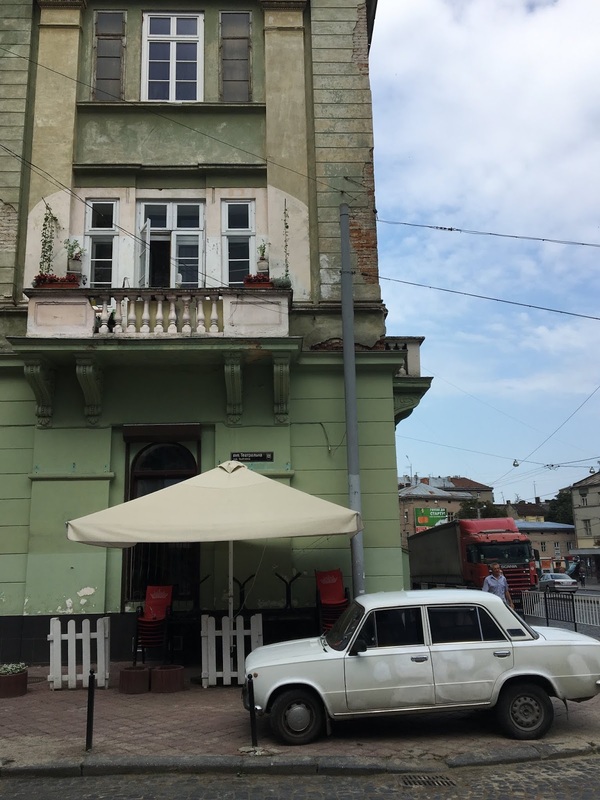 Budapest is known for its Ruin Bars, funky establishments set up in buildings that were allowed to deteriorate during the Soviet years. Prague is just as beautiful as Budapest. Rachel noted that St. Vitus Cathedral must have been the inspiration for some Disney castles. Lviv, in Ukraine, is less touristed than the other two cities, and retains some of the neglect that the Soviets bestowed on it. The car, for all my fellow Cold War peers, is a famous Russian Lada. Lviv is known for coffee and chocolate. The Vienna Cafe has been serving both since 1829. Of course, the best part was sharing the trip with my lovely daughter, who is enjoying a chimney cake here. The wedding in Ukraine was almost beyond description. But that's another post. IT looks like an absolutely fantastic trip. So much to see and learn, both joyous and full of sadness. Your daughter is just delightful, so glad you could share this amazing adventure with her. Your photos are just amazing! I can't wait to see the wedding. I can only imagine the emotional impact of visiting some of these areas. Your photos are wonderful. I had never heard of Jews being pushed into the river. I can't imagine the fear and horror those poor people experienced. The inhumanity of the Nazis is just horrendous. What an amazing trip! I am glad you got to experience this with your daughter. I have always wanted to visit Budapest - I'm not sure why, as I don't know anyone who has gone ('til now). I think it must have been from photos like these. I didn't know about the terrible story of what they did to Jews. That is haunting. Welcome home! So glad you could make the trip with your daughter. I used to work for a company where the executives were always traveling to Prague and Budapest - they all oved those trips. The architecture is just amazing. but...those shoes...like others I had not heard that story. Truly horrific. So glad you had a good trip! Our choir went to Budapest in 2001 and Prague in 2004, and like you we have wonderful memories. I had not hear about the shoes either. As Vera said, truly horrific. Welcome home; what a wonderful trip! Thank you for sharing the highlights with us!